Chris Gayle set to represent Windies in the ODI series against England. 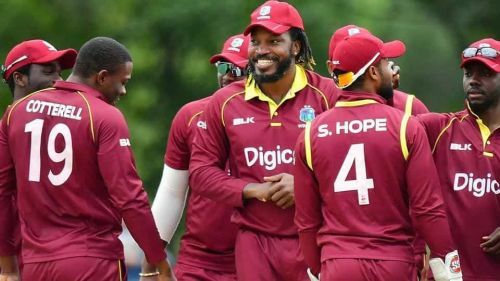 After trouncing the English in the longest format, hosts West Indies will now aim to take the momentum into the limited overs format, when they host the world number one ODI side in the opening fixture at the Kensington Oval on Wednesday, February 20. Despite beating England in the Test series, their road in the ODI's is not going to be easy. As the Caribbeans have not won an ODI series since their previous series win (3-0) against the Bangladesh side during August 2014. The hosts got a major boost in this department due to return of the universal bose Chris Gayle in their ranks. Gayle last featured for the hosts during CWC qualifier campaign and played a pivotal role in helping the Caribbeans to seal the second available slot in the CWC 2019. The opener is likely to cause the major headache for the visitors, if not dismissed early. Shai Hope was in supreme touch during previous ODI series and is coming off back two centuries against Bangladesh. As a result, there is a lot of expectations on his shoulder. Nicholas Pooran was in decent touch during Bangladesh Premier League and scored 379 runs in 11 innings. Pooran power hitting abilities are a certain plus for the team and will be expected to give some nasty blows in the middle. Skipper Jason Holder, who was suspended for the final test due to slow over rate, is also set to make a comeback in this fixture. Kemar Roach was the Caribbeans key striker in the test series and finished his proceedings with 18 wickets in three games. He will be expected to take the wickets in the ODIs against the same opponents. Jason Holder (C), Ashley Nurse, Oshane Thomas, Kemar Roach, Devendra Bishoo, Chris Gayle, Evin Lewis, Shai Hope (W), Shimron Hetmyer, Darren Bravo and Nicholas Pooran. World number 1 England eye revival in the preferred format. Despite losing the Test fixtures, one can't underestimate the visitors' capabilities in the 50-over format. They have not lost an ODI series in the Caribbean Islands in last twenty years, which should boost their confidence ahead of the clash. Skipper Eoin Morgan, Joe Root and Jos Buttler are three pillars of England's ODI lineup. All have played a key role in teams success since CWC 2015 and team will need all their big guns to come out blazing against the hosts. Meanwhile, Ben Stokes and Tom Curran are the team's key all-rounders, who can bat at a brisk rate and they will be expected to show few batting fireworks towards the end. Moeen Ali was declared Player of the Series for his all-rounder show during Windies tour of England (ODI series 2017). Ali was also most effective of the lot in the recently concluded Test series with 14 wickets, and he will be backed by the management to replicate his performance in the ODI's as well. Adil Rashid troubled the Caribbeans in their previous series in 2017 and picked seven wickets in four outings. Ben Stokes Chis Woakes, too, have been among regular wicket-takers in the ODI's and there will be Morgan's key shuffles during the powerplay and death overs. 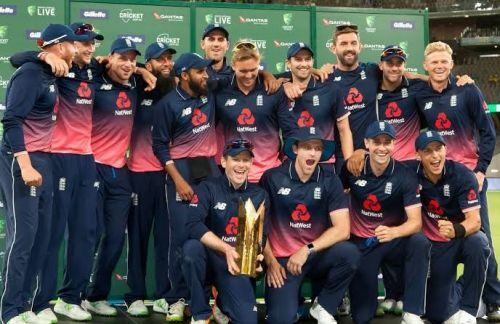 Eoin Morgan (C), Jason Roy, Jonny Bairstow, Joe Root, Ben Stokes, Jos Buttler (W), Moeen Ali, Tom Curran, Chris Woakes, Mark Wood and Adil Rashid.